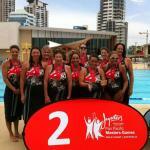 The Black Pearls recently competed in the 35's + age category at the 2014 Water Polo Masters Games in Australia and secured an impressive silver medal. The team of 2014 assembled on the Gold Coast ready to make a splash at the newly developed Southport Aquatic Centre against some old foes and friendly faces including Hutt?s Liz Burman, Suzanne McGuinness and Selena Natoli. The next Masters Pan Pacific Games will be held late October 2016 with many of the player suggesting that they should keep an eye on the 2017 games based in Auckland. This page is current to 21 Apr 2019, 02:40:11 PM and took 0.341 secs to generate.